"When I go into Berlin, I'm going to be riding that tank. The same one that's sitting there with the name Lulubelle written on her." Sahara is definitely an essential Bogie film that is often overlooked among the many classics that make up his filmography. This seems to be a small war film in that it tells the small story of a group of men traveling on a tank who get lost in the Sahara desert during a general retreat. However, as the tale unfolds, the suspense of their encounter with a superior German force, the interrelations of the characters of different nations and the action of the battle over an oasis they find all combine for a stunning example of a film depicting courage under fire, as well as war's ironies and ultimate futility. Made in an era that has been documented in various "Hollywood goes to war" documentaries, Sahara contains some of the typical clichés, but manages to transcend its genre with a natural honesty of storytelling. Embedded in Sahara are messages of tolerance and equality that give it a liberal air, distinguishing it from more reactionary films less concerned with equal rights between people of different cultures. In a telling scene, a captured German officer refuses to be searched by a black Sudanese soldier because he "doesn't want to be touched by an inferior race." Upon hearing this, Bogart sneers and says, "Tell him not to worry about his being black, it won't come off on his pretty uniform." The film manages to avoid the blatant propangandistic tone of most films made in the war years and yet, in doing so, seems to provide a more impressive portrait of "why we fight." The story begins at the battle of El Alamein when British forces are routed by the Afrika Corps of German General Erwin Rommel. As the Germans begin to encircle the British 8th Army, a general retreat is ordered with the only escape being to the south and into the open desert. Sgt Joe Gunn and his crew, "Waco" Hoyt (Bruce Bennett) and Jimmy Doyle (Dan Duryea), are part of an American Expeditionary force that has joined the British to gain combat experience. In the retreat, they encounter a group of British soldiers, which includes Lloyd Bridges as Clarkson, and they join together in the journey. Captain Halliday (Richard Nugent), a British medical officer, cedes command to Sgt. Gunn in an interesting bit of class interplay. The group also has a Free French fighter, Jean Leroux (Louis Mercier)—inevitably dubbed "Frenchie" by Bogart—and soon pick up Sudanese Sergeant Tambul (Rex Ingram) and his Italian prisoner, Guiseppe (J. Carrol Naish). Tambul knows the desert and attempts to guide them to an oasis where they might find desperately needed water. Gunn determines to leave the Italian behind because they don't have enough water to support an enemy prisoner. But Guiseppe desperately attempts to follow the tank and Gunn relents. Along the way, a rogue German plane attacks and strafes the tank but Gunn coolly shoots it out of the sky and they capture the pilot. Eventually, this motley group makes it the oasis but find that there is only a trickle of water. As they rest up, the scout car of a German battalion approaches to investigate the oasis because the German forces are also seeking water. Bogart offers the men the choice of heading back to the British lines: "they might even give us a medal," or staying and defending the oasis against the Germans and holding up the force for as long as possible: "Maybe nobody will ever know what happened here, or if it was worthwhile or... if it was all wasted..."
The men opt to stay and the German scouts are sent back to report to their unit that plenty of water is available, even though the trickle has since dried up. What follows is an exciting and fascinating test of resolve and will. The small group of soldiers dig in to hold off a force of several hundred hardened enemy soldiers with only their rifles, some mines from the scout car and Lulubelle, the tank. As the Germans approach, the group pretends to be awash in water to lure their interest and in negotiations at one point, Gunn sneeringly offers to trade water for guns. The performances in this film are solid throughout, highlighted by Bogart's Gunn, who represents all that is important in that most crucial of military figures: the Sergeant. His love of his tank, respect for his men and human life and his determination do his duty the best way he knows how make Sgt Gunn an indelible, universal character. The various other figures, including the German enemies, are deftly drawn and provide a depth of story that is rare in a war film that generally relies on familiar stereotypes. James O'Hanlon adapted the film's screenplay from a story by Philip MacDonald that was itself, interestingly, based on an incident in a Soviet photoplay, The Thirteen. Sahara was made at a time when the Soviets were our allies; it seems unlikely that a film could be made in Hollywood ten years later that would list a Soviet photoplay in the credits. Image Transfer Review: The very good transfer makes this film imminently watchable. Presented in the original 1.33:1 ratio, the source film reveals some speckling, film noise and minor damage but overall details are crisp enough and there is not the blurring and graininess of many black & white films of the era. Audio Transfer Review: Nothing special to say about the mono audio transfer. It is sufficient with decent clarity, but revealed a certain tinniness in the music. Still, going out over the home theater, the soundtrack avoided the muffled quality that often makes some older films a poor listen. We are presented with a nice group of images showing the posters for the film. Zoltan Korda: Interesting list of quality films. Humphrey Bogart: AFI's #1 Greatest Film Legend of all time. 'Nuff said. Lloyd Bridges: Although a bit player in Sahara, Bridges certainly went on to bigger and better things. Decent collections of extras on this disc are a nice enhancement. The advertising makes for a nice souvenir and the filmographies are a nice addition. The extra trailers for The Caine Mutiny, Bridge on the River Kwai and The Guns of Navarone seem superfluous and are in bad shape, but perhaps someone who was viewing Sahara had not thought of these other Columbia war films. This is a fine war film, with director Zoltan Korda combining the action of battle with the psychological implications of fighting men, and certainly is an excellent addition to any war collection. 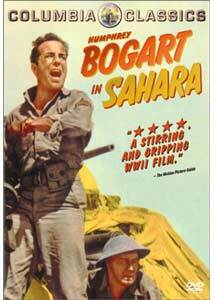 As one of Bogie's best "overlooked" films, Sahara belongs in any collection of his work.